Yes/no binary decisions by individual ants can lead to a rational decision as a collective when the individuals have differing preferences to the subject, according to research recently published in the journal Royal Society Open Science. This binary mechanism of decision-making could provide a basis for understanding how neurons in the human brain, which also make binary choices, work together. Honey bees are known to "dance" with varying levels of enthusiasm depending on the quality of nectar they find. The more attractive the nectar is, the stronger they dance, appealing to other members. As a result, the majority of the members, and later the entire colony, gather to the better option. However, this mechanism doesn't explain how a collective rationality within the brain is made because neurons can only make binary decisions. Tatsuhiro Yamamoto and Eisuke Hasegawa of Hokkaido University's Laboratory of Animal Ecology set up six experimental colonies of 56 Myrmica kotokui ants. Each individual ant was marked to distinguish them from one another. 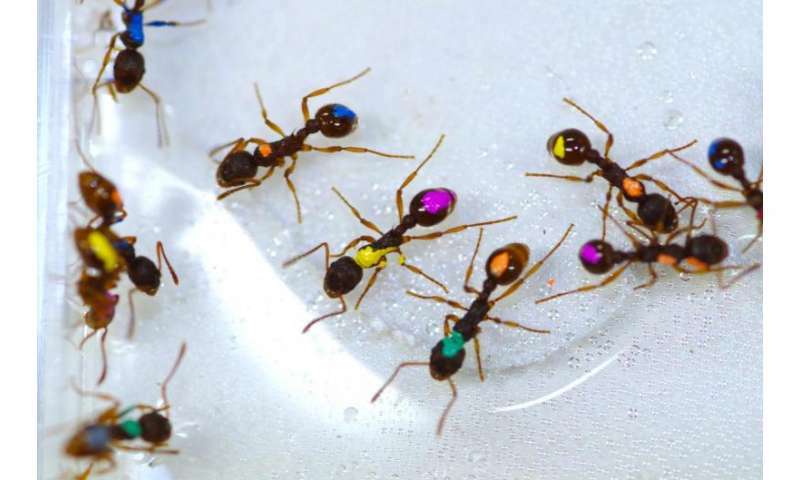 They starved the ants for three days, then fed them sucrose solution with two different concentrations: 3.5% or 4.0%, and observed their behaviour. This process was repeated three times with an interval of three days between them. The team found that individual ants had different yet consistent preferences. Some of the ants were happy to feed on either of the two solutions. Picky ants refused to feed from either. A third "middle" group consistently chose the solution with a higher concentration. These varied choices demonstrated that individual ants had individual thresholds to the sucrose concentration and made yes/no binary decisions accordingly. The researchers then fed each colony again with the differing sucrose solutions and found that the majority of the ants in all six experimental colonies chose the 4.0% sucrose solution, without being influenced by other ants in the colony. The "collective" decision of the colony was thus for the more nourishing solution. "Importantly, neither ants with a low threshold and high threshold contributed to the collective decision making, since the former didn't care about the concentration and the latter refused both concentrations. Thus, the decision maker was the middle group which preferred the higher concentration," says Hasegawa. "The study demonstrates simple yes/no judgements by individuals can lead to a collective rational decision, without using quality-graded responses, when they have diverse thresholds in the population," he continued. This mechanism can be applied to various fields including brain science, behavioural science, swarm robotics and consensus decision-making in human societies, conclude the researchers.